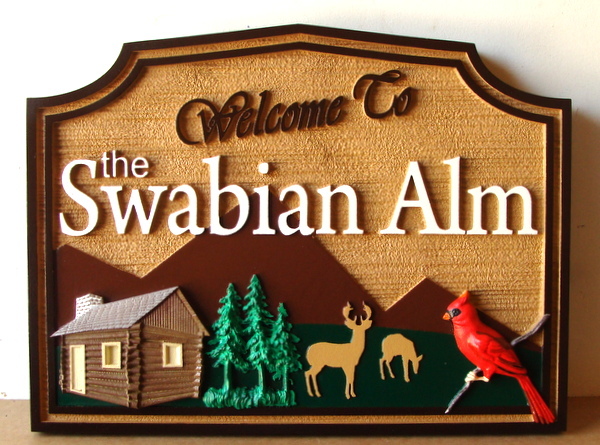 The cabin sign shown above, with trees, a deer, and a cardinal. This interesting and picturesque 3-D HDU cabin sign has been carved in both 2.5-D and 3-D relief. The text, mountains, foreground, deer and sky are carved in 2.5-D (flat) relief, and the log cabin, trees and cardinal bird are carved in 3-D and hand-painted. The sky is then sandblasted in a wood grain pattern.The sign is clear-coated twice for additional UV and weather protection. This sign is hung from its two eyehooks.